In the last post we discussed how difficult is for a microbe to get into the body. Now if once crossed the first hurdle, these microbes are greeted by variety of cells and chemicals. These body response is also non-specific, mounting similar response against all pathogens irrespective of the identity. Even though this second line of defense is non-specific there is a central system in place for collection and distribution of these cells called as lymphatic system. 3. Fever is often an associated response of inflammation. Pyrogens (temperature rising chemicals) released from damaged tissues and cells involved in inflammation induce a rise in temperature. It helps in enhancing physiological processes at times destroy infecting pathogens. Complement system participate in both innate and acquired immunities. Interferons are antiviral glycoproteins released by living cells in response to viral attack and induce a viral resistant state to neighbouring cells. 6. Natural killer cells: NK cells play an important role in the innate host defences. These cells are specialised to kill viral infected cells and tumor cells. Mode of action: The secrete cytotoxins, perforins and granyzymes which create pores in the plasma membrane of the target cell facilitating water entry into the target cell. Target cells swells and burst. These cells are vital in natural resistance to tumors as these cells participate in Fas- Fas ligand mediated apoptosis. Why NK cells are called ‘natural killer cells’? NK cells are called ‘natural killer cells’ because they are active without prior exposure to virus and are not specific for any viruses. Prior exposure to viruses has no effect on its activity. But activity of NK cells is enhanced in the presence of antibodies. 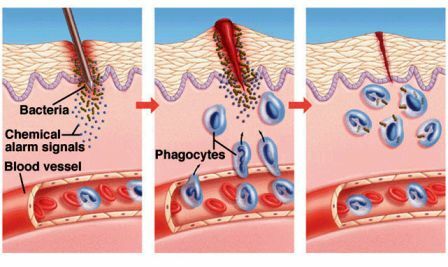 The process is called antibody-dependent cellular cytotoxicity (ADCC). Other potent activators of NK cells are IL-12 and Gamma interferon. IL-2 activated NK (LAK cells) cells are used for the treatment of certain cancers.